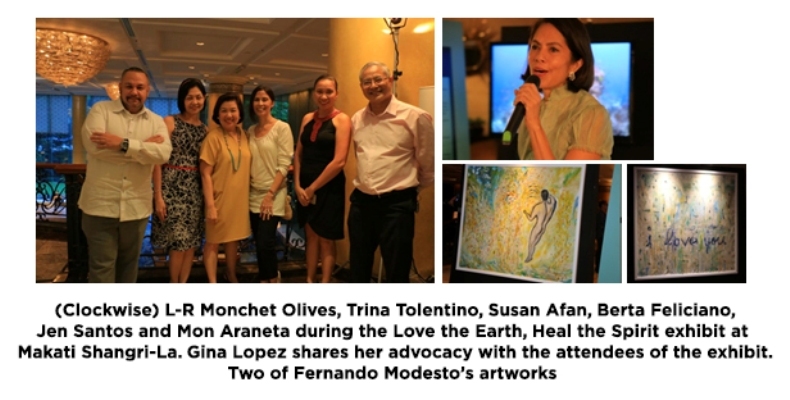 ABS-CBN Lingkod Kapamilya Foundation, Inc. (ALKFI) Chairman Gina Lopez uttered this statement during the recent Love the Earth, Heal the Spirit artwork exhibit by highly-acclaimed artist Fernando Modesto at the Makati Shangri-La. This exhibit is a product of the collaboration between ALKFI’s environmental arm, Bantay Kalikasan and a new organization called the Science, Education and Advocacy (SEA) Institute, in which Berta Lopez-Feliciano, Gina Lopez’s sister, is involved. “We in SEA Institute are made up of scientists, professionals, divers, businessmen, and yes, even a yoga instructor, who all want just one thing – to protect the immense riches within the Verde Island Passage not only for scientific purposes, but more so for the communities that border these waters. We want to use science in a practical manner and improve the lives of the people who make their living and get their food mainly from the sea. We want to duplicate our successes and share it with the rest of the coastal communities throughout our incredible nation. And closest to our hearts, we want to leave a living legacy to our children and their children,” Feliciano explained. The Verde Island Passage, dubbed as the center of the center of the world’s marine biodiversity, covers the seas along five provinces from Batangas, Oriental and Occidental Mindoro, Marinduque and Romblon. In 2015, Bantay Kalikasan and other notable partners fought to stop the mining application and the plan to put up a coal plant in Lobo, Batangas where Verde Island is located. As a better alternative, Bantay Kalikasan set up organic farms and empowered people’s organizations – an effort to create livelihood at the same time sustaining the environment. Part of the proceeds of Modesto’s artwork exhibit will be spent on more researches to learn more about the flora and fauna surrounding the Verde Island Passage and to educate the communities of its importance in the ecosystem. Visit the website seainstitute.org for more details or contact Alain Maullion at 09063145423 or email at [email protected].